In a large stock pot (5 quart) melt butter; add onion and saute until tender. Add chicken and brown well on all sides. Sprinkle with Worcestershire sauce, ground mustard and pepper. Stir in tomatoes and water and bring to a boil. 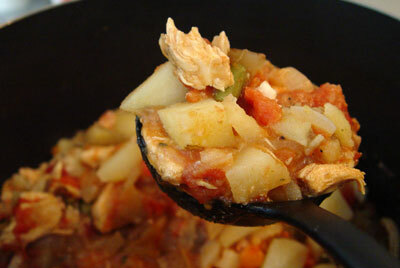 Reduce heat, cover and simmer for about 30 minutes. Add green beans, peas and potatoes. Simmer another 10 minutes until potatoes are tender.